A multidisciplinary medical conference tackles new procedures in non-operating room anesthesia and their implications on patient care. A group of the health professionals who took part in the NORA symposium. Dr. Lamperti discussed anesthetic implications for interventional neuroradiology procedures. Following his presentation on NORA in the interventional neuroradiology suite, Dr. Mawad took questions from the audience. A voting system by the audience was employed during the interactive case presentations by Drs. Lamperti and Barakat. Participants received hands-on training by experts from the LAU anesthesia team during the clinical simulation workshop. 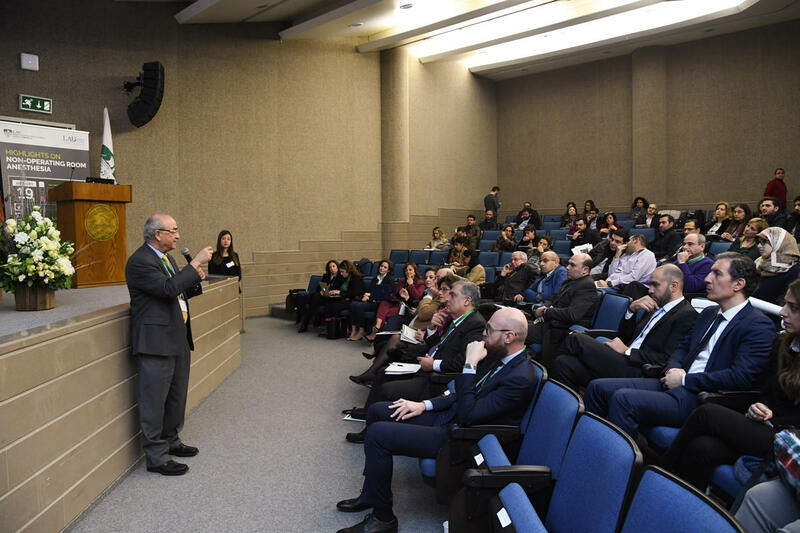 Healthcare providers, physicians, residents and department chairs from hospitals and academic institutions convened at the Gilbert and Rose-Marie Chagoury Health Sciences Auditorium on January 19 for the first LAU-led conference on Non-Operating Room Anesthesia (NORA). The conference – organized by the Department of Anesthesiology at the Gilbert and Rose-Marie Chagoury School of Medicine in collaboration with the Lebanese Society for Anesthesiologists and the Pan Arab Federation of Societies of Anesthesia, Intensive Care and Pain Management (PAFSA) – aimed to review novel procedures in NORA and discuss their implications on patients’ safety and quality of care. 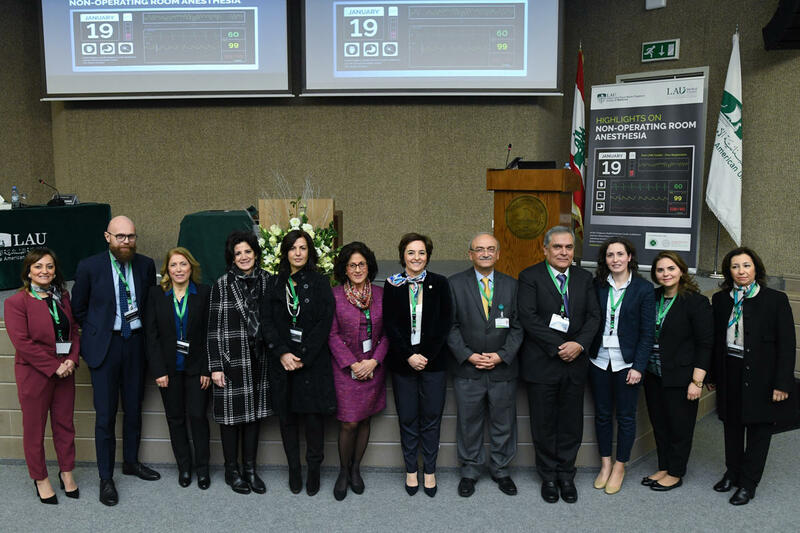 It is one of the many ways that LAU’s school of medicine and the LAU Medical Center-Rizk Hospital are raising their profile internationally and spurring medical collaboration and innovation from here in Lebanon. “With the rapid development of novel interventional techniques in cardiology, radiology, gastroenterology, pulmonary medicine and other areas,” said Chair of the Department of Anesthesiology at LAU Dr. Elie Abi Nader, “NORA has come to form a major percentage of total anesthesia cases.” This has called for anesthesiologists to become well versed in the new procedures applied outside the surgical suite. “Continuous learning, especially in medicine, is the key to success, as spreading knowledge increases safety and quality of care,” added PAFSA President Dr. Patricia Yazbeck in her welcoming note. 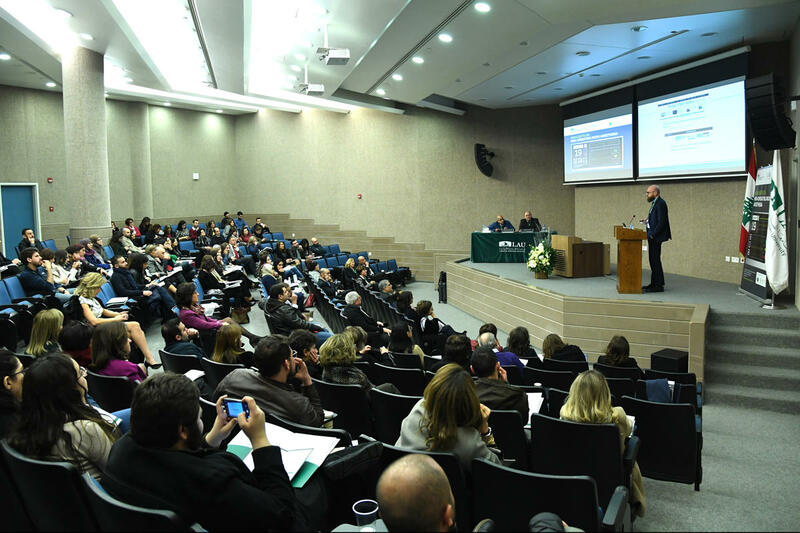 For this reason, the conference was live-streamed on the PAFSA Facebook page, making its content accessible to all 800 members across the Arab world. During his address, Dr. Abi Nader stressed the importance of discussing NORA in light of recent developments that have taken place at the LAU Medical Center-Rizk Hospital, namely the inauguration of the Comprehensive Stroke Center, the Endoscopy Unit and the Cardiac Catheterization Lab, “all of which are working environments for anesthesiologists outside the operating room,” he noted. Over four specialized sessions, the speakers reflected on the challenges of NORA in terms of the logistics of working in an unfamiliar area, the frequency of patient comorbidity, and familiarity with new procedures. Dr. Michel Mawad, dean of the Gilbert and Rose-Marie Chagoury School of Medicine, discussed NORA in the interventional neuroradiology suite, where anesthesiologists must sometimes work outside their comfort zones. “The first thing to do is to make sure we share with you the problems that arise during treatment,” Dr. Mawad told the anesthesiologists, listing cases that they must be aware of, the complications that may occur and how to handle them properly. Also sharing his expertise was world-renowned anesthesiologist Dr. Massimo Lamperti, clinical professor of anesthesiology at Cleveland Clinic Lerner College of Medicine and chief of the General Anesthesiology Department at Cleveland Clinic Abu Dhabi. In his talk, he discussed anesthetic implications for interventional neuroradiology procedures. Despite the challenges of anesthesia, such as airway management and long-distance procedures, Dr. Lamperti underlined the importance of close communication between members of the medical team. “It is only by having a teamwork approach that we can achieve better outcomes in our patients,” he said. 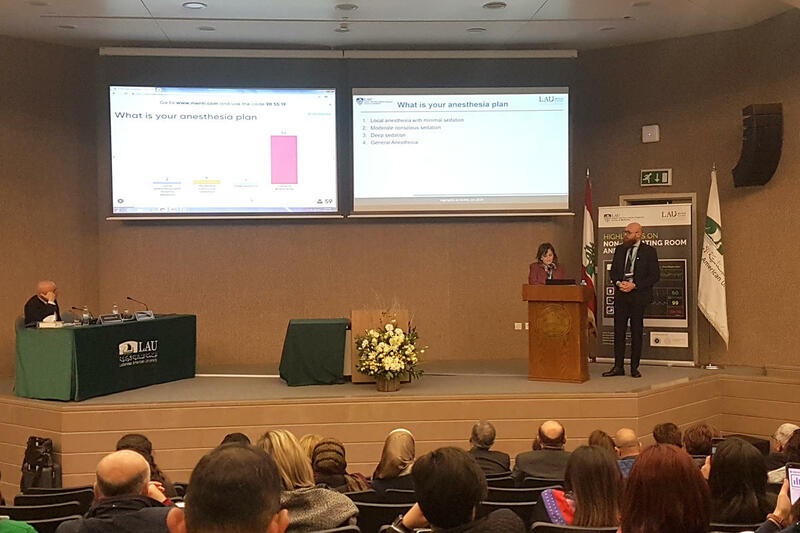 Instructor of Anesthesiology at LAU and Anesthesia Clerkship Co-Director Dr. Krystel Malek, in turn, expounded on anesthesia for magnetic resonance imaging (MRI) with an emphasis on pediatric sedation, which is needed to obtain a motion-free image of the patient. “Providing safe and effective sedation for children undergoing MRI requires skill, familiarity with the procedure, and careful planning,” she said. With a focus on anesthesiology in the Cardiac Catheterization Lab, the second session featured Clinical Professor of Cardiology Dr. Georges Ghanem, who examined the essential role of the anesthesiologist in interventional cardiology procedures. “The presence of an anesthesiologist is a great asset to ‘the Heart Team,’ which helps manage complications, decrease mortality rates, and improve quality of life,” he said. Another major field intersecting with anesthesiology is gastroenterology. This topic was addressed in the third session by Associate Professor of Medicine Dr. Rajaa Chatila, followed by Dr. Lamperti, who explored anesthetic implications and general guidelines for sedation. Because anesthesiologists face challenges practicing in locations beyond the operating room, Dr. Abi Raad shed light on the importance of simulation-based education in familiarizing anesthesiologists with standards, enhancing team performance, and improving clinical knowledge and skills through deliberate practice. On that note, the conference ended with interactive case presentations by Drs. 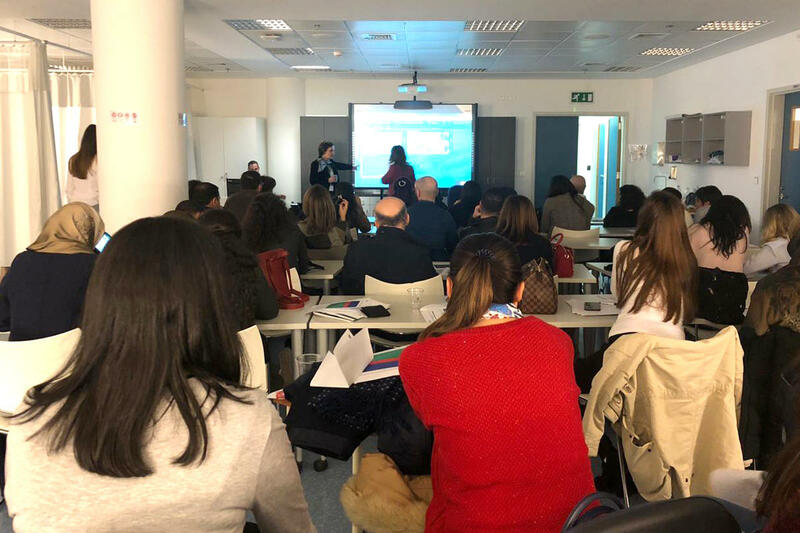 Lamperti and Barakat, and a special workshop on simulation-based education at the CSC, where participants received hands-on training by experts from the LAU anesthesia team.